Cradle Snatchers is a 1927 American silent comedy film directed by Howard Hawks. The picture is based on the 1925 Russell Medcraft and Norma Mitchell stage play of the same name that starred Mary Boland, Edna May Oliver, and Humphrey Bogart. An incomplete copy, missing part of reel 3 and all of reel 4, exists in the Library of Congress. The film was later remade as Why Leave Home? (1929). 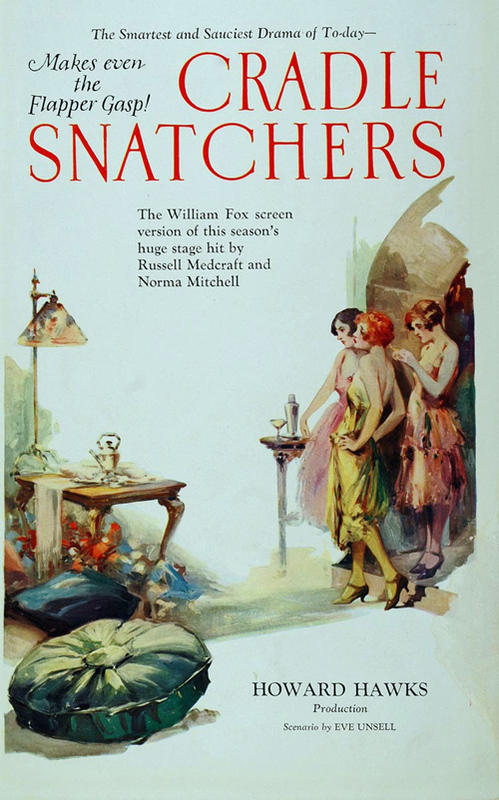 Three unhappy, middle-aged housewives teach their adulterous husbands a lesson by starting affairs with college-aged young men during the jazz age. ^ American Film Institute (1997). The American Film Institute Catalog of Motion Pictures Produced in the United States. 1921-1930. F2. University of California Press. p. 898. ISBN 0-520-20969-9. Wikimedia Commons has media related to Cradle Snatchers.